A non-comprehensive list of my favourites. Plus a small anecdote about why I like them. I can't decide who I like more, Kate... or Mouse. Every morning I am dissappointed to have woken up not looking like Lilly. Katie is a peach and so fun to talk to! Ria is perhaps the loveliest. The best magazine on the webz #biased. Suzie is just so kickass at liquid liner. Britanie shares my love for animals and has amazing hair. Ru hand made me the softest flannel, it's like a hug for the face. Liz discovers the best brands! When Ana talks about green beauty, I listen. I love finding new blogs! Thanks for your recommendations! I'm always on the hunt for new blogs, so thanks for this! Love finding out new blogs and sharing the love! There's some of my faves in this list too, plus a few new ones that I've followed. I love these posts, thanks for sharing! Thanks for the new blogs! Thanks for the recommendations! That's my evening sorted tonight! ooh, thanks for this, I can't wait to check them all out! Annabel, you are a babe yourself! And I love your blog, especially since you started to include more green beauty. Thank you love, that was such a sweet way to start my day. This is a great list Annabel. 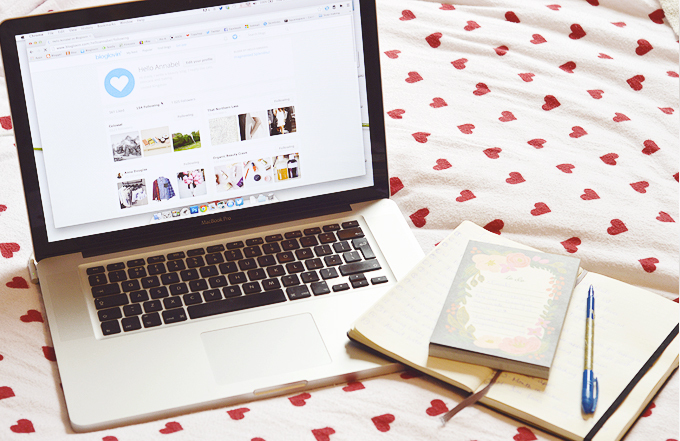 Some of my favourites are on here... we must have the same taste in blogs! I like when other bloggers share who their favourite bloggers are, as there are so many blogs out there now that it's hard to keep track. I'm new to blogging (well, since November) and I have a few follows, but I've just been finding the whole thing really difficult. I write posts and feel like no one is reading them - but I know people are visiting the page because my page views change weekly. It's just hard to stay motivated. Perhaps as I go on for longer and really figure out where I"m going (it's kind of photography/food/beauty right now but I feel like I should have mainly one instead of three categories?) I'll get more readers. At least that's what I'm hoping. Anyway thanks for reading this. My blog is http://jadetartan.blogspot.ca if you want to check it out. I love her pics and anecdotes. Her writing is relatable and she seems like a person I'd want to be friends with. A more recent find of mine, I enjoy reading her sweet blog posts whenever I have the time. Oh my gosh, her makeup looks are so gorgeous! And she is so nice and genuine. I enjoy her writing style and each and every post is a treasure.